The O-lay method is named in the range of several other offshore pipeline installation methods like J-lay and S-lay. 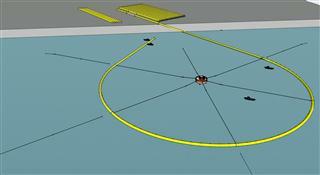 The large spiral that is made to act as an storage of pipeline can be seen as an floating "O". From this the name O-lay originates. The relatively new pipe line installation technology is developed especially to bring small offshore oil and gas fields on stream for which the exploitation and especially the installation of pipelines is too expensive with the current pipeline installation methods. During the development of the method it became clear that the method is very efficient and effective for almost any flowline and pipeline installation till 32”. in the water and stored in a floating O shaped model in front of the construction yard. One of the advantage of the O-lay method is that the pipeline is not being constructed and welded on a lay barge. Instead the pipe is fully prepared at predefined lengths on an onshore location and stored in a floating circular shape in front of the construction yard. Also the offshore handling of the pipe is uncomplicated since the pipe is a single string.